I know this is supposed to be a writing blog, but without my grandparents, Gigi and Gipop, I’m not sure if I would be a writer. When I was in 4th grade, Gigi sent me “Tuck Everlasting.” I remember trying to read the book and hating it. She usually was so spot on in the books she sent. Every year, she would send a book and while I think a lot of children would have hated that, I absolutely loved it. Reading was my life. It took me about three more years, but when I finally read “Tuck Everlasting” it became one of my favorites. I read it with the kids a few years ago, and as suspected it was too old for them. They need the life experiences of crushes and they need to rid themselves of the girls are icky stage before they can understand that book. My grandparents persisted in sending us books, even into our twenties. I have a fine collection of leather bound classics thanks to them. I give them credit, and my parents for being an avid reader, which led to me wanting to write. I usually spent a week or two during the summer at their house in Florida. They always had a dog, which I loved because we never had one growing up. My favorite dog was Zelda the dachshund. Guess who she was named for? They also had a white dog at one point, and he was so cute but so very hyper. I think at some point they had to give him away because he started biting. At their house, they never turned the TV on. At night, after Gigi killed me at a game of Scrabble, they would watch what I called “the boring news” aka “The McNeill Lehrer” hour, so I had a lot of time to read, use my imagination, and explore on my own. They also took me to the Junior Museum in Tallahassee, Wakulla Springs, antique shopping, to the mall, and maybe most importantly, Gipop let me out a gallon of whatever flavored ice cream I wanted. I have tons of memories of them, but unfortunately few photographs. Most of those are at my parents’ house. Gipop passed away a few years after I graduated from high school. By that time, they were living in Tennessee, and I drove home for his Memorial Service. Gigi carried on. She lived to be ninety-five. She read every single day of her life. A lover of words. I still think about both of them every day. I love this photo, because it looks like Caden (my son) has a huge arm. That’s actually his cousin’s arm in the background! This is Gigi at her 95th birthday party. Lovely tribute and such wonderful memories. You are lucky to have had them. My grandparents were like that as well. I used to love going over there rather than being home. They lived next door and I would always wander over around lunch time which was their dinner time! 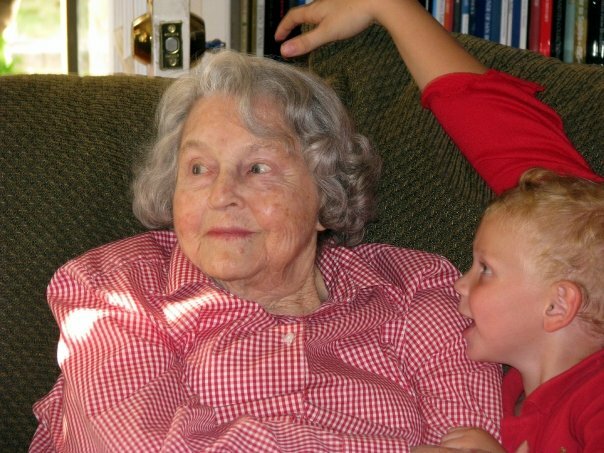 My grandfather died after I graduated high school and my grandmother lived to be 92! I only have a couple of photos and wish I had more of them. Judi-I know. I wish I had a photo of my grandfather. I have a few from my wedding but they’re pasted in a book so I can’t scan them. My kids are lucky, growing up with their grandparents 5 miles down the road. Mine lived 5 hours away, but we had such a great time spending our summers with them. I know the quality wouldn’t be the same, but have you tried taking a photo of the photo with your cell phone? I’ve done it at times and they’ve come out pretty well. I’ll have to try that, because then at least I’d have it electronically! Lauren, my heart lept when you told me your grandparents sent you a book every year. What a delightful way to share their great passion with you without placing you under any pressure to share it. Thanks Debs! They were the best. Lauren, did GiGi stand for something? ‘Cause, I am GiGi to my grandchildren! Love it! My older daughter actully chose the name, and I love it, because she says it stands for “Groovy Grandma!” Since I am a child of the groovy ’60’s, I love that! My oldest grandson, now 7, could not say a soft G however, so I became GiGi like “give”, not G like “Gee whiz!” , now that feels more like my name than Helen! In my red hat group, there are three of us who love to stand together to introduce ourselves,:”Hello, I’m Gee Gee, this is GaGa,and this is GiGi” LOL Peals of laughter! I give my grands books, even the 15 month old, and we have a million books here! I loved my Aunts who gave me books and even magazines when I was little! I loved this “story”. I love stories abut family. Its a family story, the kind your family will cherish forever, and will be so happy you wrote! Thanks Helen. As far as I know, Gigi and Gipop didn’t stand for anything, and it’s a soft G. My cousin, Joy, named them when she was really little and it stuck. My grandmother thought it was funny when I sent her a letter from camp when I was 12 and I labeled it “Mary Julia Eaddy.” She told my Dad it seemed funny for me to label it so formally! My grandparents were similar – no TV for us, ever. It was either go out and play or read books. I still have a handful of books that belonged to them when they were kids, including a reading primer, a collection of all of Shakespeare’s works, and a travel memoir, all with copyrights in the late 1800s. The best part is that they wrote their names on the flyleaves and made a few notes in margins. I love seeing the inscriptions my grandparents wrote to me inside the books. It will always be special! I’m so glad you have similar memories. Shaheen–you are so right! I hope you’re doing well. Nothing better than a supportive, reading family! I read Tuck Everlasting as an adult and enjoyed it, but wasn’t sure how today’s children would feel. I agree. Tuck Everlasting is still one of my favorite books. Every time I read a passage from it, I think of Gigi. I’m hoping my daughter will enjoy it as much as I did when she gets older. Lovely reminiscing 🙂 I had an aunt that always gave me a book for Christmas and I looked forward to that every year. I am now that aunt for my nieces and nephews whether they like it or not! Great! I have fond memories of some of my grandparents. My dad’s parents both passed away when I was little, but my mom’s parents definitely had a profound effect on me. I recall the 3 hour drives to go visit them. It was always great. Like you have few pictures of them. Honestly I have few pictures of anything from my childhood. That has totally changed, with the advent of digital photography and now with cell phones having decent cameras in them, you can take pics almost anytime. Not to mention know immediately if the picture is any good. I definitely wish I had more photos of my grandparents and my dad. Memories are great, but I love being able to see the moments of our memories. I know. I love looking at old family photos. My Dad scanned a ton to Google a few years back. I have to figure out if he’ll share those with me. Thanks for stopping by my blog, Trina! I wish you could have known yours too. My kids are growing up so close to their grandparents, and I know they will look back and treasure all of the moments they have had together, just like I did with Gigi and Gipop. Popping over from A-to-Z challenge. Thanks for visiting my blog. Enjoyed reading about your grandparents and the picture of your little boy and Grandma is priceless. I liked the big arm too.